Eastbourne Town manager John Lambert was understandably peeved after his side gave up a two-nil lead to draw two-two with Lancing at Culver Road. With both sides looking to recapture last season’s form after indifferent starts, it was Town who ended the first half on top. Ten offside decisions- seven against Lancing- had disrupted the home sides passing game, whilst Town, who were far more direct, had threatened without really forcing a save from Callum Fidler. Then, with half time approaching, a lofted ball from Ethen Strevett found Dan Bolwell haring towards the corner flag. His cross was perfect for Archibald, who simply stretched out a leg and toe-poked the ball home. Town started the second half in dominant form. Jason Taylor, the architect of most of their good work, forced a double save from Fidler immediately after the restart, and six minutes later got the reward he deserved, doubling their advantage after good work from Aaron Capon. Finally this galvanised Lancing and their neat interplay began to worry the away defence, with Luke Donaldson a particular threat. 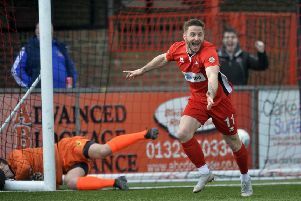 They pulled a goal back on sixty minutes, when an interchange of passes between striker Alex Fair and winger Lewis Finney left the number nine in space on the edge of the box, from where he found the corner of the net. Lancing continued to press, and five minutes before the end they got their reward, as Fair managed to beat the offside trap for once and tap home from two yards.